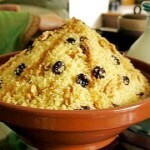 Couscous with Raisins is a Moroccan food recipe of sweetened couscous. In a medium saucepan, bring water and salt to a boil. Remove from heat and stir in couscous. Cover and let sit for 5 minutes, or until water has been absorbed. Add enough oil to coat couscous grains very lightly and mix with a fork. Heat a few cups of water in a wide, shallow pot over medium heat. Place covered saucepan of couscous in the pot to steam. Add raisins. Mix well, replace cover, and steam 10 minutes longer. Carefully remove saucepan from heat. Add butter to couscous and toss mixture to break up any lumps. Pour couscous onto a platter. 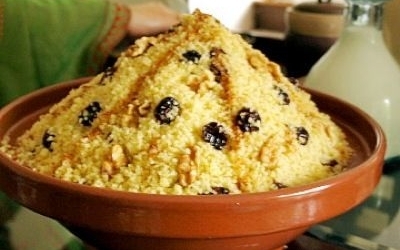 Form couscous into a mound and sprinkle sugar, cinnamon and walnuts over all.